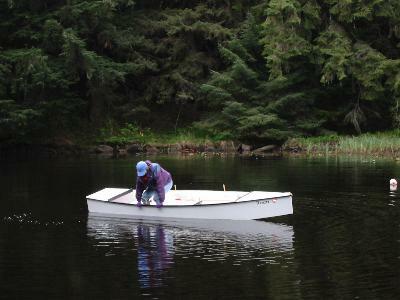 After using our Coleman Scanoe for a tender for two summers, I finally got around to building Bolger's June Bug. 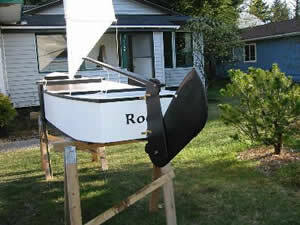 This boat was designed to be a tender for the advanced sharpies, and is extremely stable. 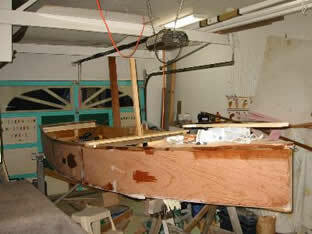 I learned about it and found advice on building it in Harold "Dynamite Payson's" Build the New Instant Boats. 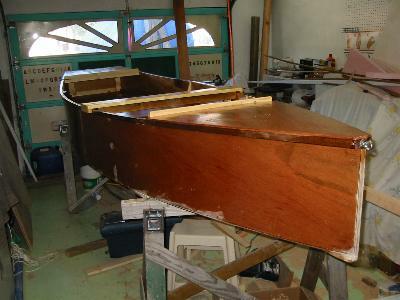 I think construction took a month or less, but because I built over winter, I allowed several extra weeks for the epoxy to cure and the paint to dry. 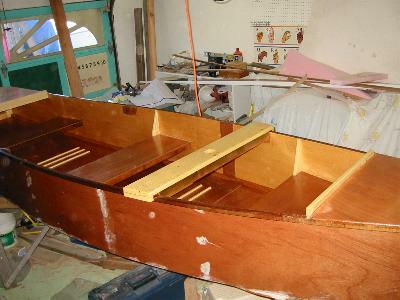 I almost left her unpainted, because the natural wood was so beautiful under the epoxy! We named her Roan (another name for the Selkie folk, and a halfway decent pun). 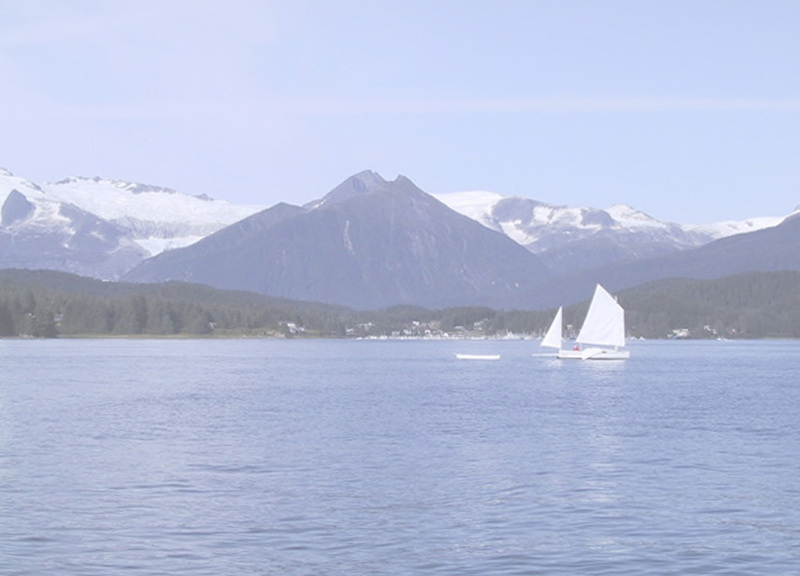 We launched her May 10, 2003. 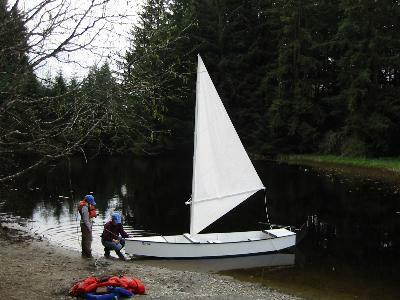 Christening in the launching lagoon at Auke Lake. 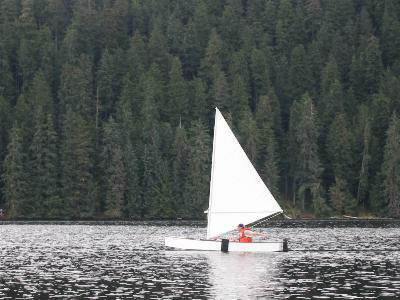 Designed primarily for rowing, she also sails very well. 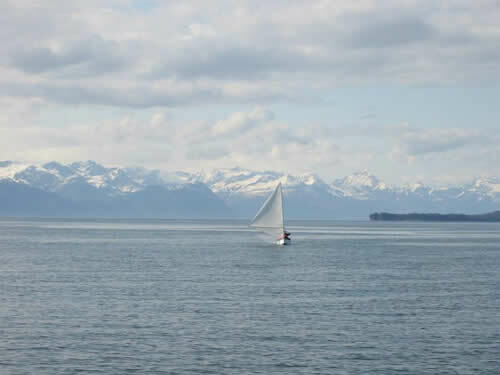 Running toward shore in Berner's Bay. 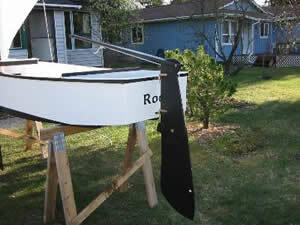 I used John Michalak's instructions for a kick-up rudder. 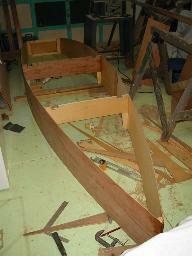 Since I used okume and luan for this boat, the recommended amount of lead in the rudder proved inadequate. I had to triple the weight to get it to sink properly after kicking up. 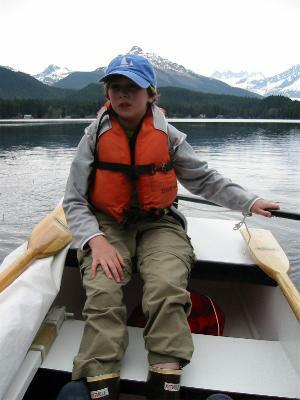 With two rowing stations and a handy deck for small helms-woman to perch on and see over the crew's head, rowing becomes a family affair. I've added a few details, like a sheet block on the tiller. 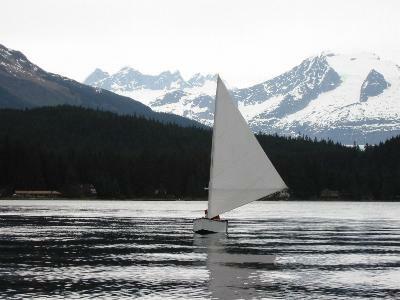 I highly recommend this design for anyone looking for a tender that's easy to row, fun to sail, and stable enough for pulling anchors and crab pots!